We’ve talked about daily journal apps here on TNW Apps before and surely you know about the idea of Twournal which can take your 140-character shares and print them out for you to enjoy later. Now, roll both of those ideas into one and you have 280daily. 280 characters to sum up your day, and soon you’ll have the ability to print out your journal for later reading. The sign-up is simple. Drop your email address and a password and you’re ready to go once you confirm the address. Once inside, you can set preferences like your time zone, whether or not (and when) you’d like to be sent reminder emails, what happens when you login and more. The simple, clean design does a great job at not distracting you from writing your daily entry, and you can go back to summarize days in the past if you wish to. Beyond the writing, there’s not a lot to the site. You can go back to view other entries, or you can choose to export what you’ve written. This exporting is what sets 280daily apart from other daily journals that we’ve reviewed. For exporting, you’re given a couple of options. You can either choose to print your dailies, or you can opt to have them saved to PDF format for you to use as you see fit. According to the site, the coming soon feature is that you’ll be able to have your entries printed into a bound book and then sent via post to your door. 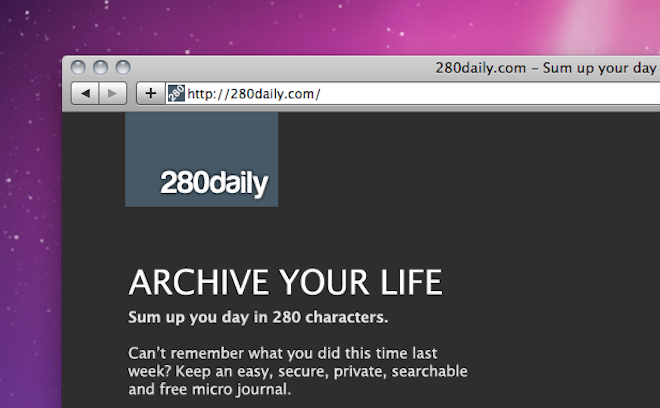 The advantage that I immediately see to 280daily over OhLife is in the character restriction. With being bound to the limit of 280 characters, it challenges you to be pithy and only highlight what really mattered from your day. The other factor that I really love about 280daily is that it’s highly optimized for mobile. Viewing the page from your iPhone, Android device or just about any modern, mobile browser is a joy. Entries are easy to do with a 280 character limit, and I think that should make for more consistent journaling, at least on my part. Give it a shot, let us know what you think. We’d love to see the ability to add a photo, otherwise, we’re impressed. While there’s still something to be said about holding a quality pen and Moleskine notebook, 280daily is a great, electronic alternative. Read next: Who's pooping on Twitter? Find out here.